Damask roses (Rosa damascena Mill.) are mainly used for essential oil production. Previous studies have indicated that all production material in Bulgaria and Turkey consists of only one genotype. Nine polymorphic microsatellite markers were used to analyze the genetic diversity of 40 accessions of R. damascena collected across major and minor rose oil production areas in Iran. All microsatellite markers showed a high level of polymorphism (5–15 alleles per microsatellite marker, with an average of 9.11 alleles per locus). Cluster analysis of genetic similarities revealed that these microsatellites identified a total of nine different genotypes. The genotype from Isfahan province, which is the major production area, was by far the most common genotype (27/40 accessions). It was identical to the Bulgarian genotype. Other genotypes (each represented by 1–4 accessions) were collected from minor production areas in several provinces, notably in the mountainous Northwest of Iran. This is the first study that uncovered genetic diversity within Damask rose. Our results will guide new collection activities to establish larger collections and manage the Iranian Damask rose genetic resources. The genotypes identified here may be directly useful for breeding. There are almost 200 species and more than 18000 cultivars in the genus Rosa . They are mostly shrubs, distributed in the temperate zones of the Northern hemisphere . One of the important Rosa species is Rosa damascena Mill., which is commercially used for essential oil production and cultivated as garden rose . In recent years, antioxidant, antibacterial and antimicrobial activities of R. damascena essential oil have been demonstrated [4–7]. Three recent studies on molecular analyses of genetic diversity of Rosa damascena Mill. 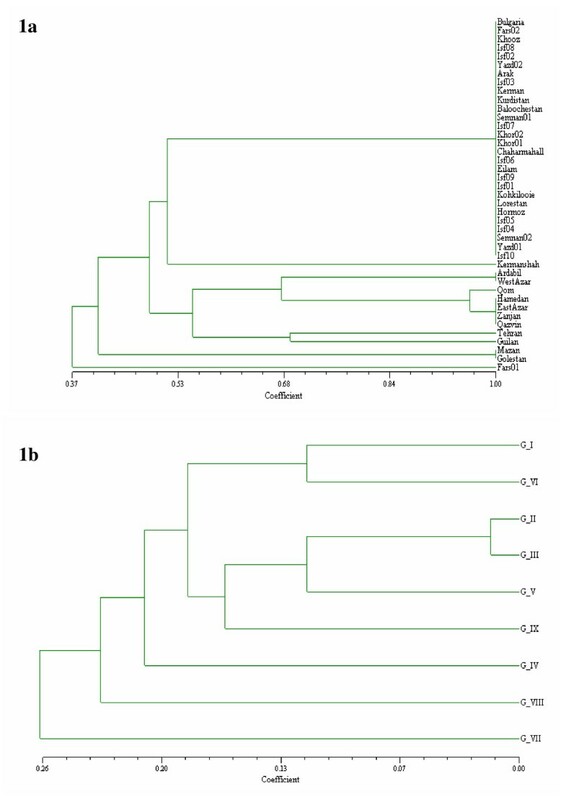 with RAPD, AFLP and SSR markers did not show any polymorphism among R. damascena plants from various plantations in Turkey[8, 9] and Bulgaria, indicating that commercial production of essential oil is in fact done by large scale propagation of only one or very few genotypes. R. damascena can now be found in the wild in Morocco, Andalusia, the Middle East, and the Caucasus. As Damask roses were originally introduced from the Middle East into Western Europe, it is thought that the origin and centre of diversity of Damask roses can be found in this region. In Iran, cultivation and consumption of Damask roses has a long history. Crude distillation of roses was probably developed in Persia in the late 7th century A.D. [3, 10–12]. In order to study genetic diversity of R. damascena in Iran, all relevant geographical regions of Iran were sampled. Some samples were taken from large production fields in the main rose oil production area in the centre of the country, but most of the samples were collected from smaller production fields and abandoned fields in remote and mountainous areas. In this way 40 Damask rose accessions were collected from 28 provinces of Iran. Results on morphology and oil content variation suggest that this collection may include multiple genotypes . In this investigation, a microsatellite marker analysis of the Iranian collection of R. damascena is reported. We show that we have obtained as much as nine different genotypes, of which some have been used for regional production of Damask rose oil. In this study 40 accessions of Rosa damascena (Table 1) that showed a high level of phenotypic and oil content variation were analyzed with nine microsatellite markers. All markers detected polymorphisms among the samples. The number of alleles ranged from 5 to 15 with an average of 9.11 (Table 2). Using the MAC-PR method, we determined the allelic configurations at six loci (RhP519, RhB303, RhEO506, RhD221, RhP50, RhE2b) for all investigated accessions (Table 3). a Yearly mean temperature in warm, temperate and cool climates are 15–25°C, 10–15°C and 0–5°C, respectively. Yearly mean rainfalls in semi humid, semi arid and arid climates are 600–1400 mm, 300–600 mm and 100–300 mm, respectively. Characteristics of the microsatellite markers used. Cluster analysis resulted in grouping of the 40 accessions into nine distinct genotypes (Fig. 1). The main group consisted of 27 landraces that showed the same microsatellite profile. This group included all accessions from the main rose oil production sites of Damask rose in Iran. The pattern of this group was identical to that of an accession from Bulgarian production areas. Rusanov et al. showed that all Bulgarian Damask roses are this genotype . 1a UPGMA clustering of Dice genetic similarities based on dominant scores of microsatellite alleles, among all accessions of Damask rose included in this study. Note that 1 (similarity) = genetically identical. 1b UPGMA clustering of genetic distances based on pairwise Fst among the nine unique genotypes, derived from codominant scores of six microsatellite loci. Note that 0 (distance) = genetically identical. The other genotypes that we identified in the cluster analyses were present in much smaller numbers. Some genotypes were unique (accessions from Tehran, Guilan, Kermanshah, Qom provinces and one accession from Fars province); others were present as two or four accessions (Fig. 1a and Table 1). The unique accessions were from mountainous and remote areas in the Northwest of Iran where roses are cultivated on small scale. In addition, the accessions from the humid area near the Caspian Sea were different from all other accessions as well. The accessions from Fars province formed two distinct clusters in the dendrogram. They are from an environmentally very distinct region, far to the South of Iran. One of these samples was hexaploid, while all other samples were tetraploid, as expected for R. damascena. As expected, the absolute magnitude of genetic distances based on codominant scoring is much smaller than that of dominant scores, as more alleles are shared, but the topologies of the trees (Figure 1a and Figure 1b) are largely comparable for those samples that were not too genetically distant. It seems that for commercial rose production only one and the same genotype is used in several countries. This makes it likely that also in Turkey this genotype is being used for large-scale production, but this remains to be confirmed as samples from Turkey were not included in the study of Rusanov et al. nor in the present study. Except one plant, all genotypes identified here were tetraploid, consistent with the general literature. One plant was hexaploid. At this moment, we do not know whether this is the first of more hexaploid R. damascena plants. It may be misclassified, but cuttings from all plants have been evaluated by several experienced taxonomists after cultivation for 2–3 years in a common garden. The genetic distances among accessions were not correlated with geographical distances among their places of origins (not shown). Clearly, a larger sample of genotypes will be necessary to determine whether there is some relationship with geographical distance, whether there is isolation of populations due to barriers in gene flow, or whether different climatic conditions lead to differentiation within the species. In MAC-PR analysis we determined the allelic configuration based on six loci, because in the other three loci, not all alleles were present in plants in completely heterozygous configurations, which is necessary to be able to accurately determine the relative amplification of each allele . Genotype G_II and G_III differ by only one allele at locus RhEO506. This is surprising as genotypes in roses are usually identical (due to vegetative propagation) or very different (due to segregation of alleles from the heterozygous parents) . Remarkably, this small difference is confirmed in the MAC-PR analysis, as no differences were found in allele frequencies at the other five loci. Although this does not completely rule out that the two plants are close relatives, a mutation leading to an allele that is one repeat longer is a more likely possibility. Genotype G_III was from Qom, which borders the three provinces in which genotype G_II was found. Our analysis showed for the first time the existence of multiple genotypes within Rosa damascena. We are currently performing an analysis of oil production across several years, in order to determine whether different genotypes also have a qualitative difference in production and/or composition of essential oil. If so, these genotypes may be used to broaden the production of rose oil, and they can also be used as the basis of a breeding program. As these nine genotypes were found after sampling only 40 large and small production fields, we expect that a more intensive sampling will be valuable in order to find more genetic diversity. For this, we will focus on the areas where we have found the unique genotypes, i.e., the Western and Northern provinces. A total of 40 Damask rose accessions were collected from 28 provinces of Iran (Table 1), in order to obtain a good geographical coverage of the country and a good coverage of the 13 different climatic regions that have been identified . Samples were taken from commercial production fields and from small (< 5 ha) or abandoned production fields. All accessions were grown from 2000 onwards in experimental field of the Research Institute of Forests and Rangelands (RIFR), Tehran, Iran. DNA was extracted from fresh young leaves using the Qiagen DNeasy Plant Mini Kit (Westburg, The Netherlands). A set of nine robust microsatellite markers were selected from Esselink et al. and Yan et al. representing different linkage groups on the genetic map of rose (Table 2). These markers are highly polymorphic in hybrid tea rose  and in other Rosa species [18–20], and hence have a high discriminative power to differentiate genotypes. Fluorescently labelled (6FAM, HEX or NED) primer pairs were amplified in three multiplexes using the Qiagen PCR multiplex kit (Westburg, The Netherlands). The PCR program for amplification were as follows: 94°C for 15 min; 30 cycles of 94°C for 30 s, ramp to 50°C (1°C/s), 50°C for 30 s, ramp to 72°C (1°C/s), 72°C for 2 min; and a final elongation step at 72°C for 10 min. Fluorescent amplification products were detected using an ABI Prism 3700 DNA Analyzer (Applied Biosystems) and all samples were genotyped in accordance with reference alleles for each locus as described by Vosman et al. , using Genotyper 3.5 NT (Applied Biosystems). The microsatellite DNA allele counting – peak ratios method (MAC-PR), which was developed for the tetraploid hybrid tea rose (Rosa × hybrida L.) varieties by Esselink et al. , assigns precise allelic configurations (the actual genotype) based on quantitative values for peak areas provided by the Genotyper software. For each locus, all alleles were analyzed in pairwise combinations in order to determine their copy number in the individual samples. This was accomplished by calculating ratios between the peak areas for two alleles in all samples in which these two alleles occurred together. Genetic distances were calculated either as Dice similarities on the basis of dominant scoring of individual alleles in NTSYS 2.1 (Applied Biostatistics) or as pairwise Fst of the MAC-PR genotypes using SPAGeDi 1.2 . The use of Dice (Nei & Li) coefficient is more suitable for codominant markers such as SSRs when they are scored dominantly [23, 24]. The accessions were clustered using the unweighted pair group method using arithmetic averages (UPGMA) module of NTSYS. The authors would like to thank Yolanda Noordijk for her kind assistance in laboratory procedures. Also, we acknowledge Ivan Atanassov, AgroBioInstitute, Sofia, Bulgaria and Natasha Kovacheva, Institute of Rose and Aromatic Plants, Kazanlak, Bulgaria for providing leaf material of Bulgarian damask roses. Ben Vosman and Paul Arens are greatly acknowledged for their critical comments. This work is partly financed by the Ministry of Science, Research and Technology of Iran (MSRTI) through a travel grant for A. Babaei. SRTA established the Damask rose collection. AB, SRTA, MKK, MRN and RO designed the study. AB selected plant material and performed DNA extraction. AB, GDE and MJMS performed SSR and data analysis. AB, MJMS, GDE and MRN wrote the primary draft. All authors were involved in the final version of the paper.